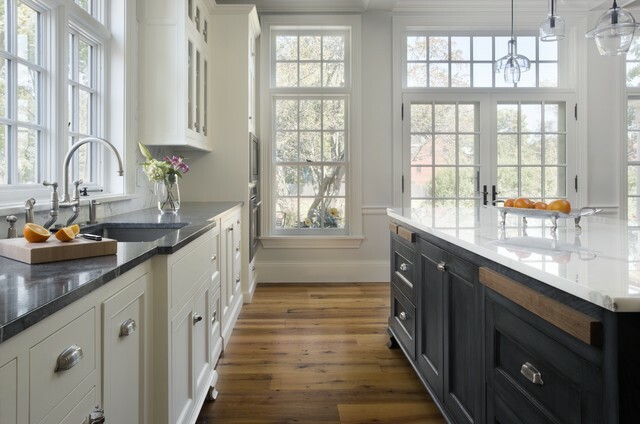 History is in the details - Traditional - Kitchen - Boston - by Jewett Farms + Co.
What is the species of wood for the floor? I am building a house and would LOVE the formula to your stain for the island. Please Provide it, so I can tell my builder. I will send my email address if you need it. Thank you!! Do you know if the trim was also Mascarpone? Or is it another White? If so, do you know what the trim color is? What color is the island? - Thanks! Could you share the island colour/finish/stain? Thank you. Thanks, found the answer with another photo: "The cabinetry is White Oak and the finish is a special technique we developed. It combines a base color with a black glaze." cabinet hardware - Can you share the source for the cabinetry hardware? Thanks! Richelieu carries lots of fantastic hardware. I find that the Blume stuff is the best, it's got great adjustability and the soft-close is the best in the business! Beautiful Kitchen! Are there any pictures of the rest of the room? light fixtures are from where? Sorry but we do not know the source of the light fixtures. Love the gray countertop under window. what kind of material is it? Island countertop? - What type of countertop was used on the island. Beautiful kitchen! Would you say wall Color is a light blue? - Hard to tell in picture. Thanks! I believe the walls are a shade of white - but I am not sure of the exact color. Love the island color. Would you be willing to share name? Thank you! Kitchen love - I am painting my cabinets mascarpone....could you tell me the wall paint color you used? Love it! Sorry - we have been unable to find this info. I love the color of the island. What type of wood is it made out of and what is the color? Is it a paint or a stain? I love the floors. - I have red oak floors. Is there a stain or oil I can use to get them this color? Sorry faithjk - without seeing your floors I don't think I can answer that. Check the Pro's directory for a Houzz flooring specialist in your area. Ask a local flooring finisher to give you a few samples to review. I think it may be a hard floor to match with the Red Oak often having lots of pinks and reds to contend with. Where is the cutting board from? The sink countertop is Barroca Soapstone. Hello, beautiful space! Would you happen to know what was used for the backsplash? Thankx! Wall color / cabinet color - Amazing kitchen. Can you please tell me the color of both the walls and white cabinets? Thank you for sharing! Could you tell me what color the island is please? is the counter grey barroca soapstone? what is the specific color? Definitely looks like barocca. Beautiful! The perimeter tops are soapstone. What color and brand of paint was used on the gray cabinets? Thank you. The cabinet colors are white and blue. Do you recall the name of the white colour? Floor source - Who did you get the floors from? Having a hard time out here in San Jose, CA to get wide plank reclaimed oak. Thanks! Hi Kathleen, those are our floors. We have a wonderful selection of high quality reclaimed and old growth wide plank flooring. If you are having trouble sourcing floors we would be happy to help you out. We are currently in the process of re-designing the flooring section of our website to showcase all the species we carry. Email Mike@jewettfarms.com for more flooring information. what is the material on the island? What finish was used on the door hardware throughout the house? What did you use for the floor specifically? Thank you. From comments from the builder """The floors are antique oak. You can learn a little more about them here.http://jewettfarms.com/flooring/reclaimed/antique-oak/"""
What brand of counters and counter tops are used? - Thank you! On the left are Barroca soapstone countertops. On the right Carrara marble. Great Floors - Do you recall the type of wood and color of stain? Do you have the name of the door manufacturer? What colour are the cabinets? Sorry but we do not know the exact dimensions of this room. What is the purpose of the unstained wood on the island? Those are removable cutting boards. Sorry - we don't have that info on file any longer. Island? - Is the island stained? If so, what color? The island finish is our own special procedure featuring a few different coats and colors to achieve the finished look. Cabinets - Can you tell me, what color white you used on these cabinets? Make and model of kitchen faucet? Thanks! Can you please provide the source for the counter stools? Traditional. In a more traditional scheme, embrace warm browns and choose charcoal-blacks, or go for an antiqued finish to literally soften black’s hard edges. Interesting: blue/grey bottom to island with white (not solid?) counter top and then reverse behind: white cabinets with grey counter and I have stainless appliances.